Many people ask me about my photography and how I light my shots. Many of my photos are taken in a photo tent with diffused lighting from the sides and a soft box light from the front. Sometimes I will use an overhead ( highlight or hairlight) lamp. I find that I use this setup many times because the light where I live is…well..crap. I live in the Pacific Northwest of the United States where we get rain 7 out of 12 months a year. Don’t get me wrong, I love living here. When it comes to photography , however, it can be a challenge. Yesterday, I was so very excited. We had one of those beautiful Indian Summer glory days…bright blue sky and abundant sunshine. I was redressing Ms. Envied after doing some redress shots, The sunshine was coming in the window at a perfect angle to project a grid pattern on the carpet so I just posed Ms. Envied on her stand, laid down on the floor and started snapping. You can make a tripod out of your arms by bracing both elbows on the floor or any stable surface. 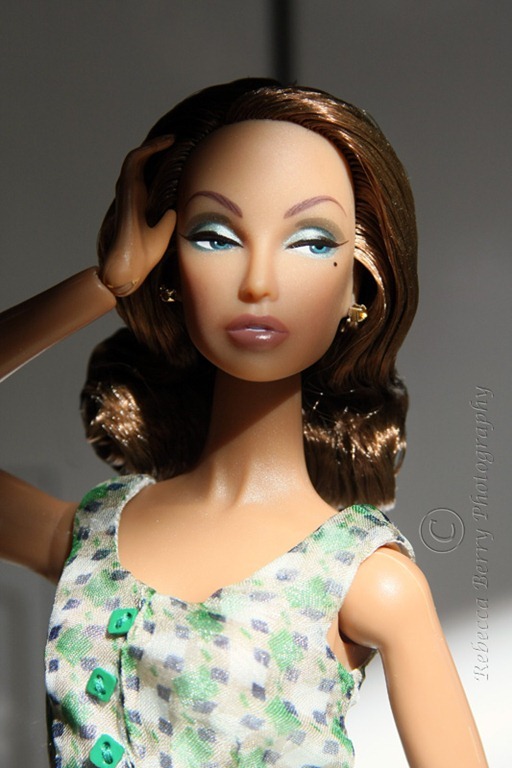 Just goes to show yet again….you don’t need a fancy light tent to take good doll photos. I love this shot. Sooooooo dramatic. This entry was posted on September 21, 2011 by raberry65. It was filed under Doll photography, Fashion Royalty, Monogram and was tagged with Doll Photography, Fashion Royalty Monogram, Fashion Royalty Monogram "Envied". She looks lovely in the natural light! Thank you my dear! I just love using natural light when I can. Goodness knows, we get it very rarely LOL! I just bought an OTT light yesterday for doing handwork. I am wondering if it would be useful for taking pictures as well. Have you ever used one? Yes, I have one for detail work as well but I have never used it to take photos. I think the light might be a bit harsh for photos but then I have never tried so what do I know LOL! You should just try it out.